Dr. Newton’s work is interested in evaluating how cultural texts or scriptures, can inform a sense of individual and group identity. 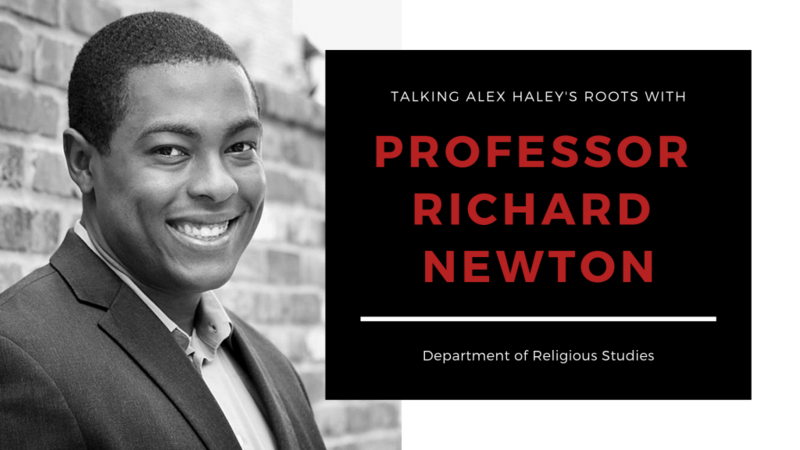 Currently, he is working on his first book, Identifying Roots: Alex Haley and the Anthropology of Scriptures, and hopes it will be available for purchase within the next year. As alluded to in its title, this work focuses on the cultural implications of the Alex Haley bestselling novel Roots: The Saga of an American Family. First released in August 1976, Americans lined up to purchase a copy of the book. Five short months later, thousands of families gathered around their television to watch each new episode of the Roots miniseries. The nation was buzzing with discussions of heritage. This exploration of Alex Haley’s family history not only entertained close to 130 million viewers but encouraged them to evaluate their own roots, as Dr. Newton explained. This was also one of the first times in American entertainment that a cast was made up of almost entirely African-American actors portraying a story from their own history. As a work of literature, it was one of the first stories to lower the boundary between history and fiction. Alex Haley even termed his work “faction,” since it included elements of both fact and fiction, and Americans in the late 1970’s loved it. The obsession continued well beyond the late ’70s and into modern popular media. Kunta Kinte continued to be referenced in television and film. Most recently, the History Channel (with help from A&E and Lifetime) made a reboot of the television series that premiered in 2016. Prof. Newton claims that Roots encouraged people to seek out their own historical identities, which simultaneously led to the creation of larger group identities. The quote from the author of Roots, Alex Haley, reflects this perception. Dr. Newton explained that the popularity of Alex Haley’s story stimulated an identity-seeking phenomenon across the US. People of varying socioeconomic, ethnic, and racial groups were equally curious to discover their own “Kunta Kinte ancestor”. This new desire to establish a cultural history not only sprouted searches for individual identity but exemplified Dr. Newton’s interest in the anthropology of scriptures (or the idea that the “texts that people read sometimes seem to read them back” as Prof. Newton said). While books are just ink on a page that lack human abilities like reading, the analogy alludes to the relationship between text and identity, an idea Dr. Newton has explored through multiple venues. The way people interact with, invest in, and talk about cultural texts is something that interests Prof. Newton, and he hopes his writing might create a new analytical language that could be used to chart this relationship. Dr. Newton presents a deeper and more elaborate exploration of these ideas in his upcoming book, but until its release, more information can be found on blog posts like this one. check out his website, sowingtheseed.org. This entry was posted in Faculty Blog, News, Relevance of Humanities, Religion in Culture and tagged Alex Haley, anthropology, Cultural Identity, Dr. Newton, fiction, History, Identity Formation, Religion in American History, Religion in Culture, Religion in Pop Culture, religion in the US, Richard Newton, Roots, Scriptures by Morgan Frick. Bookmark the permalink.